Savor Sunday lunch at Young Island. 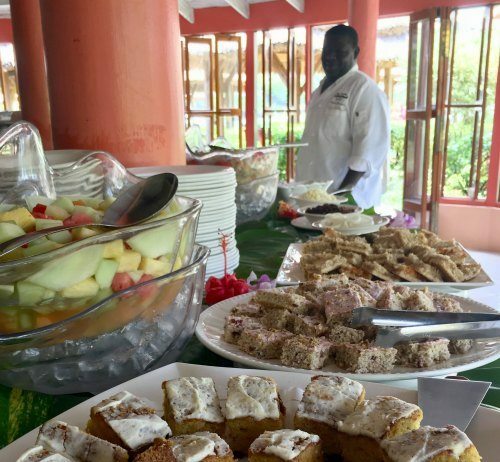 Each week, our talented chefs prepare a delicious spread of island cuisine. Favorite entrees include curried goat/beef, chicken, and fish. The homemade fruit chutney, grated coconut, hard boiled eggs and raisins are also quite popular, and can be enjoyed on top of rice or as a side. And, for dessert, we offer a variety of sweet items, including fruit salad. Enjoy your lunch in our thatched dining huts, while admiring spectacular beach views. This is a wonderful event for resort guests and locals alike! Join us on Sundays from 12:30 – 2:30 p.m. The price is USD$31.50 or EC$85 per person, plus beverages.